Note: Extract of my newsletter sent on 14th December, 2015 to my newsletter subscribers. If you want to receive such newsletters please register here. In-spite of turmoils in the world Market Nifty has shown support at 7600 and actually is moving up. BUT the point is this – there is BIG news coming on 15th and 16th December 2015 – The FED rate hike, and markets all over the world, like I have said before will figure the results by today or tomorrow’s closing. Now, Nifty showing resistant is a GREAT sign. But that does not mean we declare 7600 is the bottom. INDIA VIX is at 17.89 that is 4.13% up from Fridays close. It may go up tomorrow because we will know the results only on Wednesday or may be Thursday here in India. Once the result is out VIX drops and our trade benefits. How Can My Paid Subscribers Trade FED Rate Hike? This part is only for people who have taken my conservative stock option course. Strategy 1 looks the safest. High VIX and not much chance of Nifty moving 5%, but very high chance of VIX dropping. You can trade that. But remember that VIX may increase tomorrow as well so if you have cash, trade some lots today and some tomorrow. 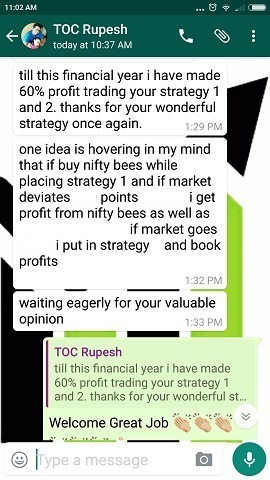 If you are already in strategy 1 and its at break even and if you are trading with a discount broker, I would suggest close some lots and create a new strategy 1. You will profit more in the SAME time. If you are on 5 close 2 or 3 and make a new trade. No need to close all lots as we are looking for risk-management NOT jumping from one trade to another just because VIX is high. 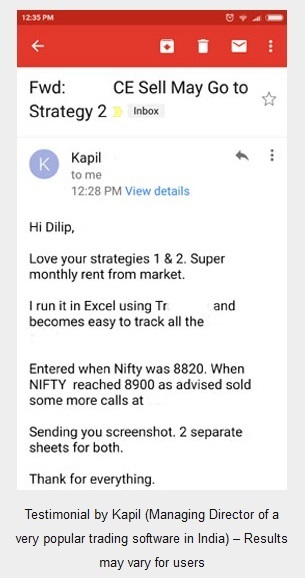 For aggressive traders: Strategy 2 can also be traded directly PUT side – risk slightly more but rewards are great. 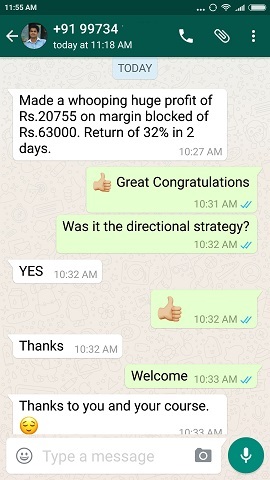 15% increase means most market participants believe 7500 is a very crucial level for Nifty and it may not break that. But remember that this is what most of the trades believe – but many time open interests are broken. Since OI is highest at 7500, Will Nifty break or not break this? Please remember that anything can happen in markets. But here is some common sense that can be applied. So people looking for software, please use your common sense and learn to work hard. Ok back to topic. The whole world knows 25 basis points increase (0.25%) is almost certain. Nifty will factor that in by tomorrows’ closing. If that does not happen Nifty is headed up. If that happens, since its already factored in, on Wednesday or Thursday (meeting is for 2 days) morning, Nifty will NOT show any gaps up or down, but VIX will drop for sure. Now what are the chances that FED will increase rates by 50 basis points or 0.50%? Very slim. For us the real issue is chances of FED increasing rates by 0.50%. If it happens Nifty for sure will gap open down by at least 1-2% and keep going down. But chances of 0.50% rate hike is NIL. So I do not expect a very huge (like 5%) gap up/down after the news. And all paid subscribers of my course know that a small movement is nothing for us. We benefit. 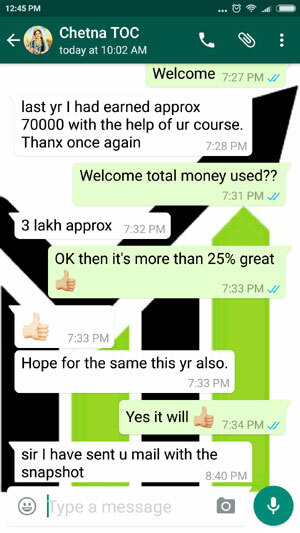 I have NOT taken your paid course – What can I trade? Well of course I cannot reveal the strategy here of my course, but please do not buy options for next two days until VIX is increasing – you will lose money big time. And if you are selling options please hedge. DO NOT sell naked – risk-reward is never in favor of naked option sellers when a big news is expected. And ask yourself what is stopping you from taking my course? There are many traders who have known about my site since the last 1 year and have not taken the course. After 1 year they email me saying all their money got wiped out, please help. Now when everything is gone and you are left with some 10 or 20k how can I help? Do not let that happen to you. Rest its your call. Hope you all make good profits. Today INDIA VIX is at 18.06 up by 1.46%. This was expected as written in my yesterdays email (see top of this page). Nifty is not showing much movement today which indicates it has already factored in a FED rate hike. A 25 basis points or 0.25% increase is what it has already factored in and probably will close at current levels of 7650. If FED does not increase rates – still markets won’t move much as that is the second possibility. However if FED increases rates by 50 basis (0.50%) points then Nifty may fall 100-150 points. But VIX will drop for sure even if there is a fall. Quick profits to be made. Strategy 1 right now looks very safe. Note that FIIs have taken money out from our stock markets in the hope that FED will increase rates. If it doesn’t I assume they will again start pumping money in our stock markets and Nifty may start moving up again. So its great time to accumulate your favorite stocks in cash. Make sure not to make lump-sum investments – but keep some cash for further downfall. If the stock moves up you make profits anyway.